Again, I had some pretty great pickup when stamping. My own shaky hands betrayed me with a few stray lines, but that is not the fault of the image unless you want to blame it for having straight lines. Heh. I love the silliness of this plate. 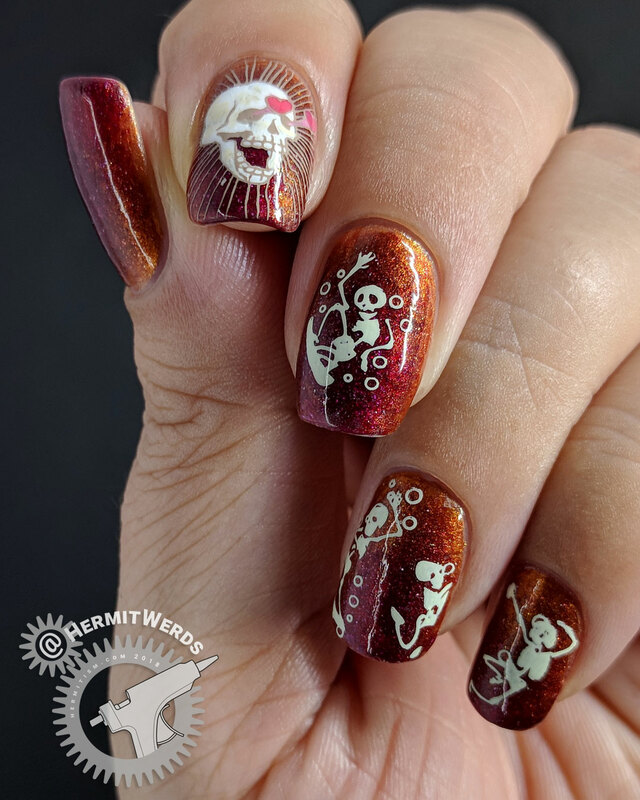 Everything from geek skeleton to explorer skeleton and also a nice range of negative space full-nail images. 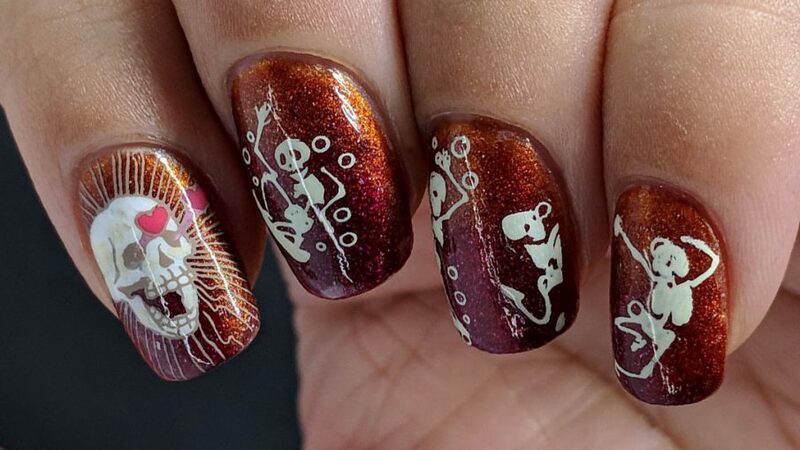 When I first got into stamping, I did not understand how awesome a negative space image could be because I struggled to use them. Now that I have tools like Beauty BigBang’s big silicone stamper and techniques like stamping over nail foil glue, they really appeal to me. 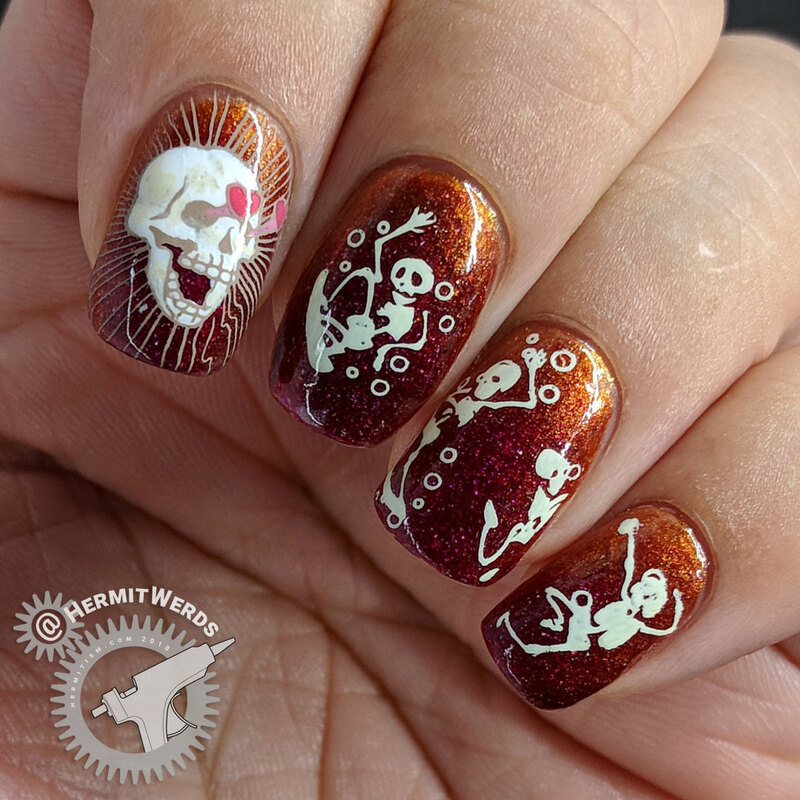 I do wish the designer had properly centered the damask skull pattern, but it was still fun to use. Did I go neon? Oh, yes, I went full neon! Also, I am obsessed with those little winged eyeballs. Expect to see them again, (outside of the Halloween season if I don’t get to it in time). Raver Damask. Background is China Glaze’s “Dandy Lyin’ Around”. Stamping done with Mundo de Unas’ “Lemon Tree”, “Neon Pink”, “Neon Orange”, and “Neon Yellow”. French Eye Bat. Background is China Glaze “All Wrapped Up” and Sephora’s Formula X “Catalyst”. 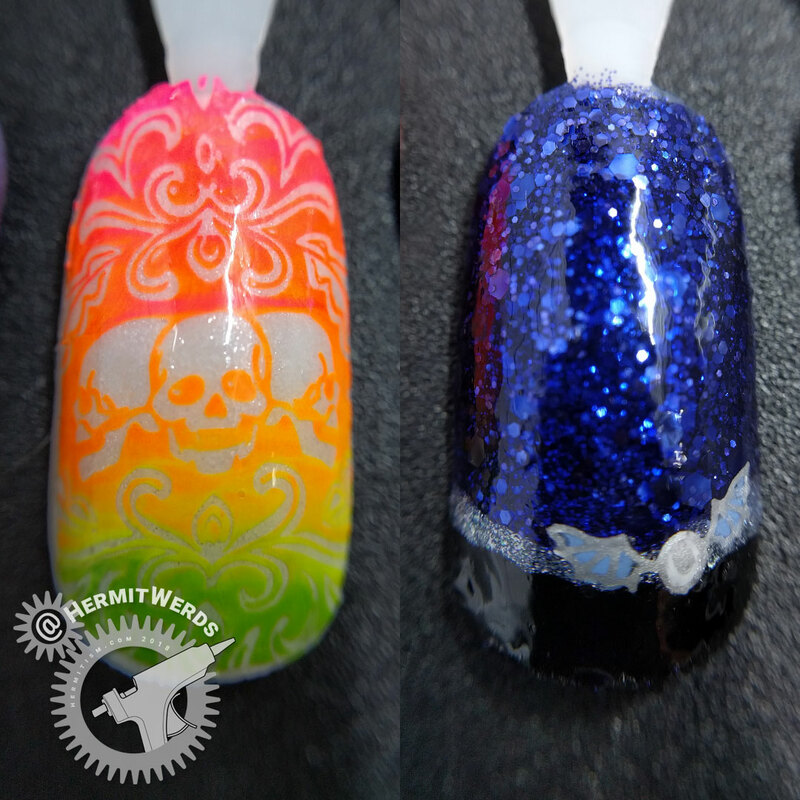 Stamping done with Sinful Colors’ “Casablanca” and filled in with “Sinful Colors’ “Sail La Vie” and “Whiteboard”. French tip created with Revlon’s Parfumerie “Espresso” and outlined with Sinful Colors’ Nail Art silver. I really love how this half radial gradient ended up looking. You probably could get much the same effect with a duochrome. But! 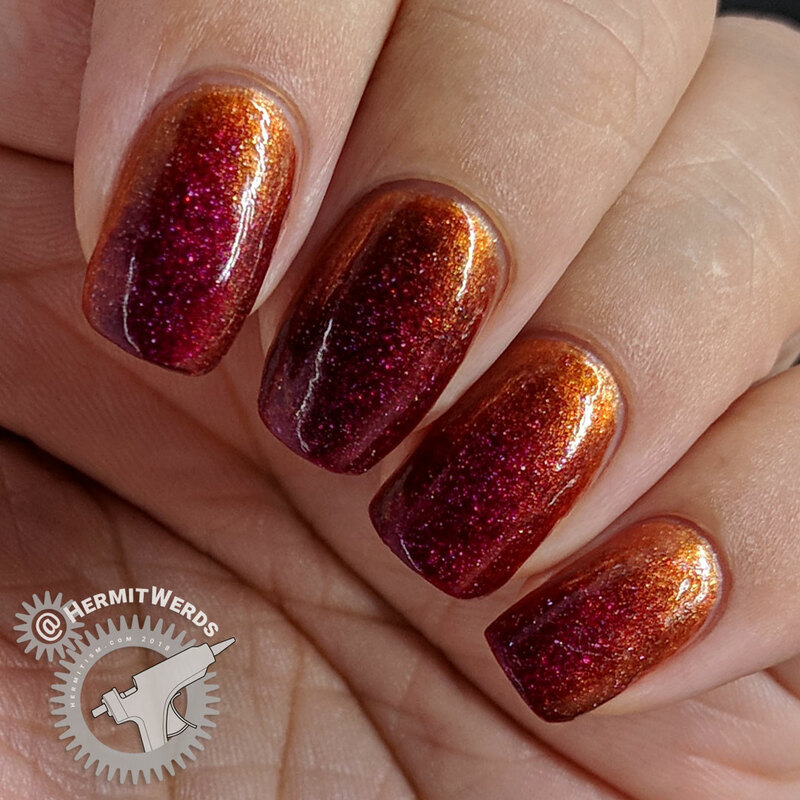 If you don’t have one, layering a glittery jelly over a metallic seems to work well. 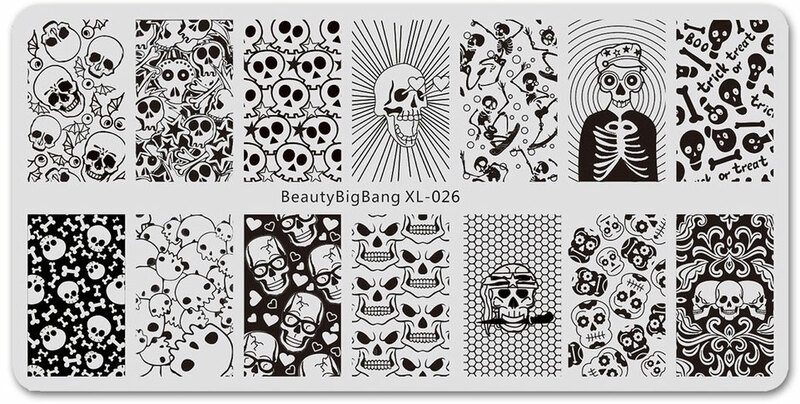 If you’re interested in the stamping plate (BBBXL-028) feel free to use my discount code (hermi) for 10% off your order. (Non-affiliate code). Thanks again, Maggie!